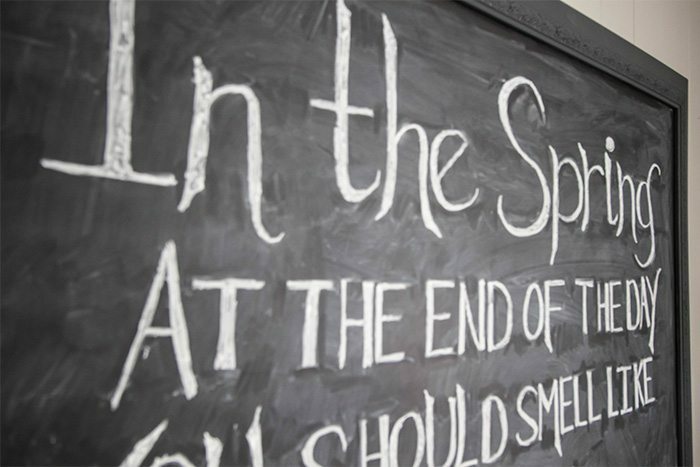 I’ve always been a little mystified at how people make their chalkboard lettering look so beautiful but I was convinced that learning this skill was just not for me. I was actually kind of under the impression that they just had really steady hands and were able to just draw really straight letters like that naturally. Attempting to do that just seemed like a recipe for disaster and big-time frustration, so I avoided even trying. For years. One sunny afternoon a few weeks ago, a magical little corner of the internet called Skillshare popped into my life though. 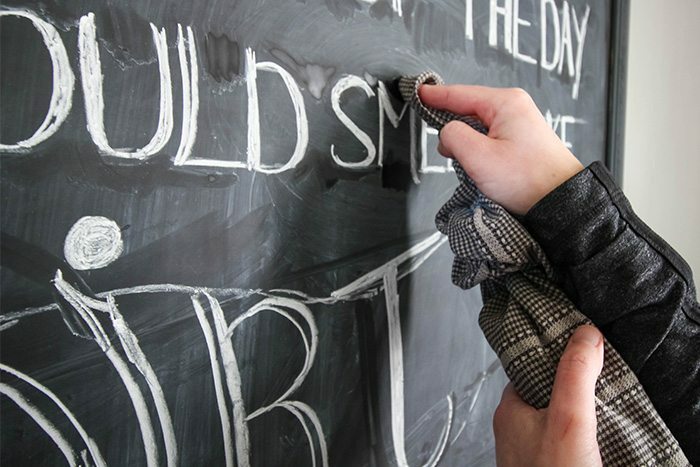 I spent 30-something minutes watching a lovely professional hand letterer (seriously, that’s a thing) named Lauren Hom walk me through the steps for perfect chalkboard lettering in her class “Hand Lettering for Chalk Murals” and I was all set! I’m so excited to be able to offer 2 free months of Skillshare to all of my readers today so you can go check out that chalkboard lettering class for yourself and then take a whole bunch of other classes that look interesting to you for free! Seriously, go check it out. Skillshare is an online learning community for creators full to the brim with interesting, useful, applicable-to-real-life online classes that you can take from experts in all different fields from photography, to social media, to home styling and design, to cooking, to flower arranging, to everything in between. There are over 15,000 classes available to take and I have to say that I’m actually, genuinely super excited about the classes they have available. They’re all set out in a way that’s very clear and easy to understand, and the subjects are all things that real people like you and I are interested in and able to use in our daily lives. Skillshare put together a little video to introduce you to Lauren Hom, her class, and basically what she’s all about. It makes a difference to have classes taught by really interesting, fun, likable people, don’t you think? I absolutely loved my chalkboard lettering class and felt inspired to get up and try out my new skill right away. Of course, you can go take the class from the expert yourself, but I wanted to share some of my notes and my learning process here with you today too! The first thing I learned is that chalkboard lettering doesn’t require any kind of fancy materials. 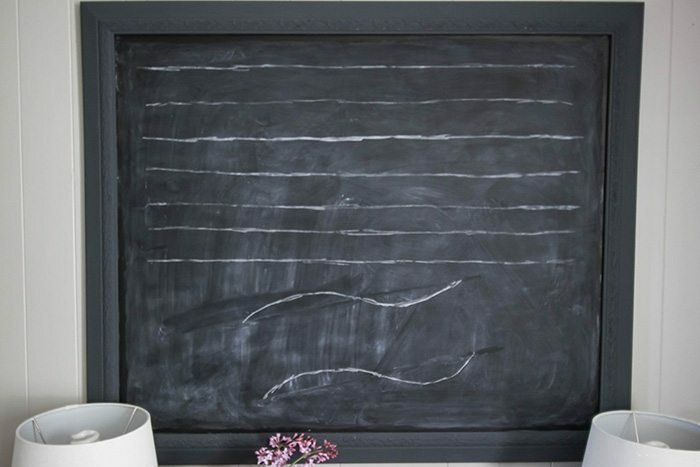 I think I was always under the impression that anyone who was good at chalkboard art always used those fancy chalkboard pens, but that’s just not the case, regular old chalk will do! 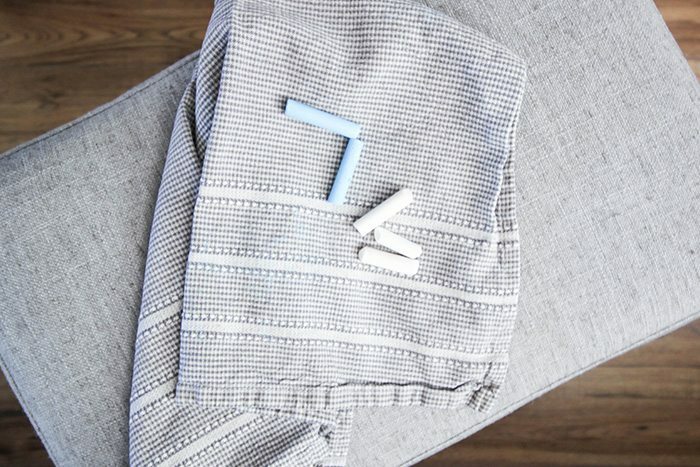 The best eraser is just a damp towel! I loved watching the letters themselves come together in the videos for the class. The letters really are made up of very simple, easy-to-replicate parts that come together to make something magical. I was really impressed to see how the letters all started off as very simple shapes, just like I would normally draw, but then became these amazing fancy-shmancy letters with a few simple additions! 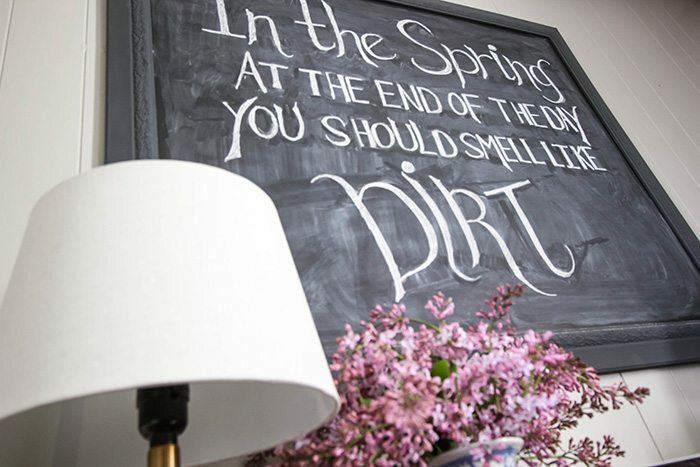 It’s amazing what a difference the finishing touches can make in a piece of chalkboard art, or even just how adding a little extra thickness to your letters can make them really stand out. Again, the piece as a whole comes together to look so artful and actually kind of complicated, but when you look at each element and each letter up close, you’ll see there really isn’t anything to it. Actually, each letter on its own (on my chalkboard at least) looks really imperfect, but when you see all the letters together, it looks great. This class was a series of really small videos, each just a few minutes long. I found that to be super helpful because I could go back and re-watch a part of the class if I found I was getting a little stuck when I was working on my project. 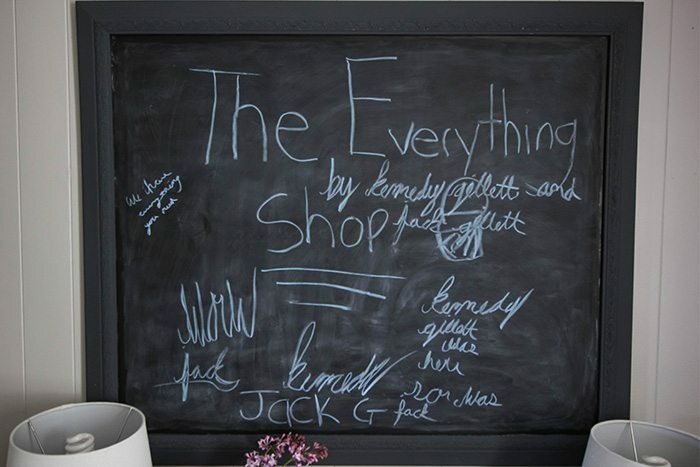 Each section was really quick and easy to find and that made the chalkboard art really fun and non-frustrating to play around with. So here’s my finished chalkboard! Pretty great for someone who had no clue and pretty much refused to even learn how to do chalkboard art just a few short weeks ago though, don’t you think? –Be very very light with your guidelines because you will need to erase them. 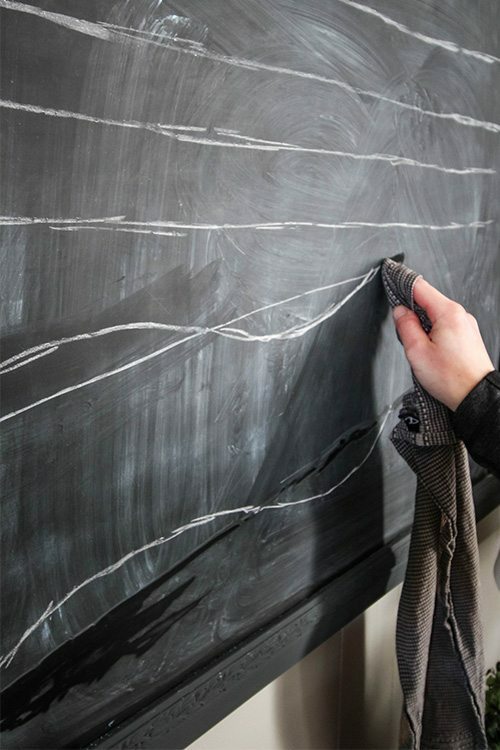 If you make them too heavy, then you’ll end up with smudges on your chalkboard when you go to erase. I made mine a little heavier so you could see them clearly in the photos and they were a little tough to erase cleanly. –Don’t be afraid to give individual letters their own little personalities. 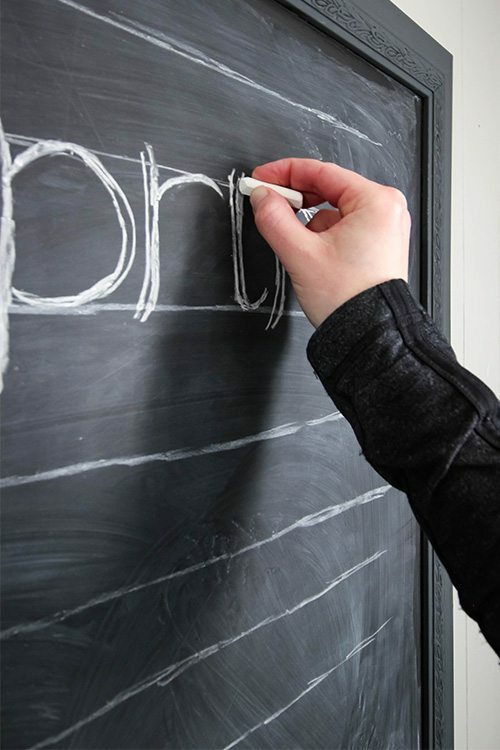 The letters on your chalkboard don’t need to completely match the style of all the other letters on your board, or even on the same line. 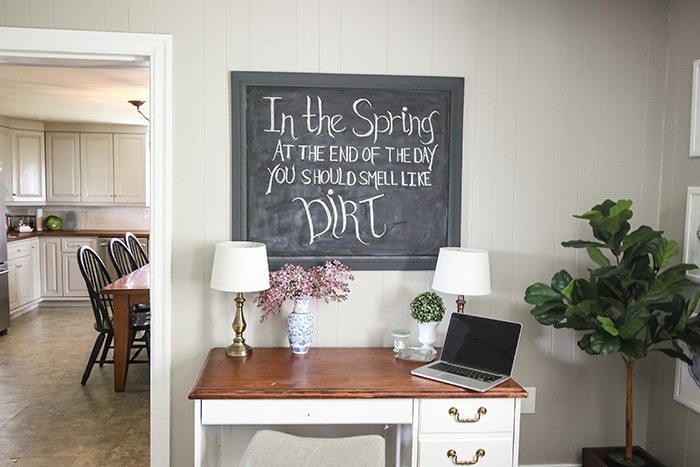 Actually, adding little flourishes to random letters here and there really adds to the overall personality of the whole chalkboard. Definitely go check out Skillshare for yourself and pick up a few new skills while you’re at it! There are a few different flower arranging classes that are calling my name right now so I think I’ll spend a few minutes during the evenings this week brushing up on my skills for all the summer flowers coming my way! Skillshare Premium Membership begins at $10 per month, but as a reader of The Creek Line House, you’re entitled to two free months to try it out! Just click here to redeem your coupon for 2 free months! Have you tried Skillshare before? What classes are you going to check out first? Thanks so much to Skillshare for sponsoring this post! I was compensated for my time putting this post together but all ideas, opinions, and suggestions are my own as always! I clicked on the free 2 months offer and tried to sign up. Why do I have to give my credit card information if the first 2 months are free? I did attempt to give this information, but my expiration date would not print. I was unable to sign up. I was wondering if anyone else had this problem? It is something I am interested in, but there is a problem in signing up, at least for me there is. Thank you for making this available to your readers. Hi Anita! Thanks so much for letting me know. I’ve already emailed my contact there, so hopefully he’ll be able to help us out with this! Just heard back from him! He said that things seem to be working fine on his end. Hopefully it was just a temporary glitch and things are working well for you now. If not, please email help@skillshare.com and they should get back to you ASAP! Signed up for Skillshare, but keep getting a message “there is a problem with this site”. Won’t let me connect. Help? Hi Wanda! I’ll email my contact at Skillshare and see if they can get this figured out for us. So sorry about that! Thanks for letting us know! Hi again! I just heard back from my contact there. He said things seem to be working fine from his end now. Hopefully that was just a temporary glitch and everything’s working for you now as well. If not, please email help@skillshare.com and they’ll get back to you ASAP! I LOVE this quote! I’ve never heard it and I am a huge Margaret Atwood fan so I’m not sure how I missed it. 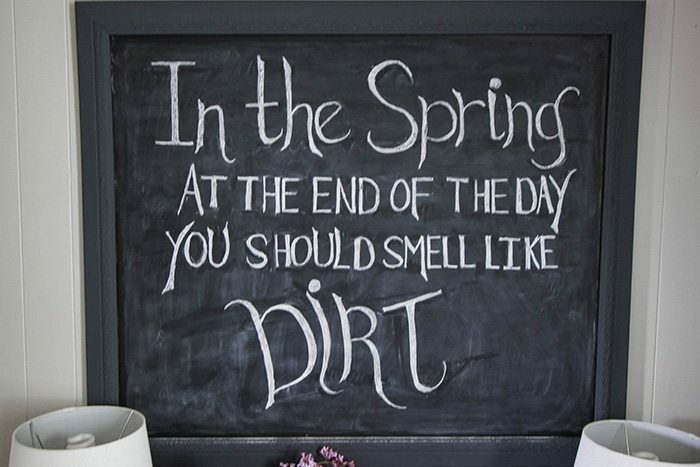 It looks great on your chalkboard. Thanks for the tips!